2015: Year of the Trader? After lying dormant for most of last year, volatility has come storming back. The Chicago Board Options Exchange Market Volatility Index (VIX)—a leading measure of implied volatility of S&P 500 index options—has already cleared 20 six times this year. 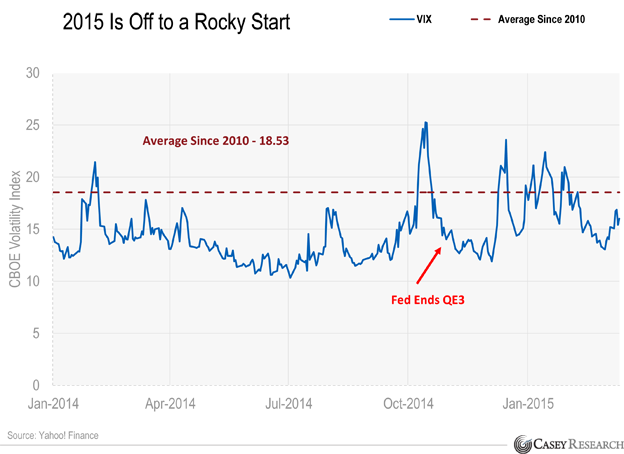 Last year, the VIX topped this important psychological barrier just 10 times, and six of those instances occurred in mid-October just before the Federal Reserve ended QE3. The return of volatility in October was no surprise. Quantitative easing had been the driving force behind US stocks since the 2008 financial crisis. The Fed’s easy-money policies had also served as a soothing agent for market volatility. This should concern investors. After an impressive February jobs report, the Fed is now expected to raise interest rates as soon as June. But Fed Chair Janet Yellen understands that lifting rates too much or too soon could shock the financial markets, so don’t be surprised if the Fed takes its time. Nonetheless, the mere prospect of a rate hike has put the market on high alert. Investors aren’t used to this. For the past six years, US financial markets have taken bad news in stride. It’s easy to be lulled to sleep when the Fed is administering a steady stream of liquidity. Now that the QE gravy train has stopped, investors are finding it harder to ignore weak economic data and geopolitical instability. And there’s a lot of both to worry about. The possibility of Greece exiting the European Union still looms large. Conflicts between Russia and Ukraine are far from resolved. Commodity prices have tanked, and China’s economy is slowing. The US stock market also appears to be running on borrowed time. The S&P 500 just celebrated six years without a major correction. Bull markets don’t die of old age, but fatigue is more likely to set in if the Fed stays its course. For example, corporate America may struggle to attract investors if cheap credit dries up and prevents companies from juicing EPS figures via share buybacks. At this point, you may be nodding in agreement. But you’ve also probably heard countless arguments like this over the past six years, and all US equities have done is continue to set record highs. Point taken, but this time is different. The Fed is no longer propping up stocks through asset purchases. The market must also adjust to $50-per-barrel oil. Finally, the USD just hit an 11-year high against a basket of currencies and is approaching parity with the euro. The ingredients for a volatile year are in place. However, it’s important to realize that there is nothing inherently bad about volatility. Volatility is a trader’s best friend. It produces opportunities—both in rising and falling markets. The average investor, on the other hand, is less fond of wild price swings, and for good reason. Periods of extreme volatility usually precede a downturn or occur during a bear market. We obviously aren’t experiencing the latter. Still, a correction is not guaranteed even if 2015 turns into a roller-coaster ride. Yellen could calm the markets by merely dropping the word “patient” in her next address. Remember, central banks run the show these days. In any case, it’s critical that investors prepare for the unexpected. Unfortunately, traditional safe havens aren’t appealing at the moment. Precious metals have been stuck in a rut for years. US Treasuries are yielding close to all-time lows while US defensive stocks—utilities in particular—just took a dive. To stay afloat in these choppy waters, investors must be prudent, disciplined, and creative. That’s the very strategy Casey Research employs. If you haven’t already, maybe it’s time to tap the Casey brain trust.